A profound commitment to upholding human rights, educating Somalia's children, caring for Somalia's women and children, and spreading hope run in Dr. Hawa Abdi's family. Her two daughters, Dr. Deqo and Dr. Amina, now run the operations at Hope Village. Deqo Aden Mohamed was born in Mogadishu and grew up feeding the refugees her mother was harboring. Deqo earned an MD in Moscow in 2000. She was an OB-GYN resident in Russia up to 2003. She continued to go back to Hope Village to work during her holidays. She came to America as a refugee in 2003 and gained extensive experience working in healthcare. She became a naturalized American in 2008. Today, she works full time on the ground in Somalia. She leads all operations in Hope Village and is responsible for ensuring the safety of the 300 families who have found permanent shelter in the community. She simultaneously manages the administrative aspects of DHAF as CEO of the organization in the United States. Dr. Mohamed works tirelessly with other organizations, universities, and donors to bring new innovations and services to the residents of Hope Village. Dr. Mohamed regularly attends conferences and speaks on behalf of DHAF, her mother’s lifework, and on Somalia. Recently, she was invited as a guest speaker at the HÖFÐI Reykjavik Peace Centre's Imagine Forum and African Leadership Network's Annual Gathering. In 2016, Dr. Mohamed was a Maurice R. Greenberg World Fellow at Yale University. Dr. Mohamed has been featured on media outlets such as TED, the Leonard Lopate Show, and The Daily Beast. Dr Hawa Abdi Diblaawe was born in 1947 in Mogadishu. Her father was a worker in the city’s port and her mother died when she was very young. As the eldest child, Hawa was forced to raise her four sisters in conditions of poverty. But she never lost sight of her dreams. With the help of a Soviet scholarship, Hawa studied medicine in Kiev and soon became Somalia’s first female gynecologist. She then completed a Law degree at the Somali National University in Mogadishu, where she later became an Assistant Professor of Medicine. She soon opened a clinic on her family’s ancestral land in the Afgooye Corridor, using the profits from her family land to provide free health care to all of her countrymen. When the civil war began in 1991, Dr. Hawa started housing her employees on her land, feeding them and caring for them. Soon their friends and relatives came seeking shelter, then after the friends and relatives of their friends and relatives. Dr. Hawa welcomed them all, providing shelter to all those who came regardless of where they came from. In 2012, Dr. Hawa’s land housed more than 90,000 refugees, most of whom are women and children. 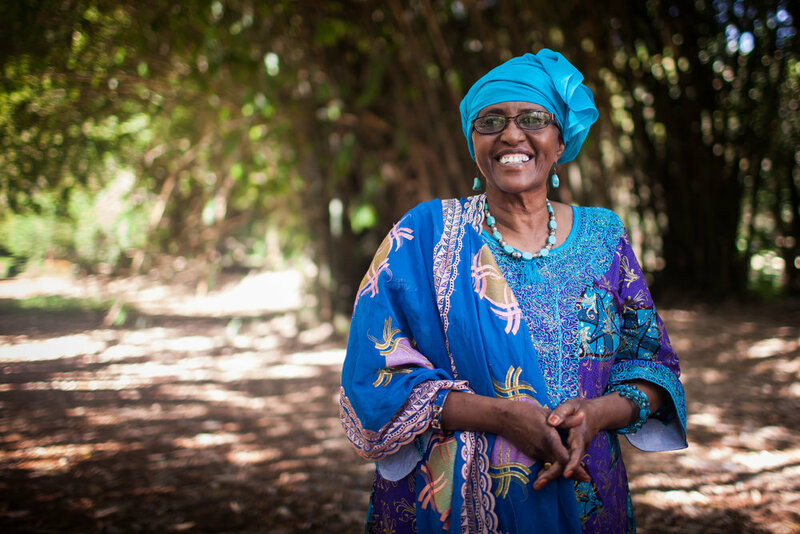 Dr. Hawa has won numerous distinctions and awards, including the John Jay Justice Award, Vital Voices’ Women of the Year Award and a nomination for the Noble Peace Prize in 2012. U.S Secretary of State Hillary Clinton has called Dr Abdi “a perfect example of the kind of woman who inspires me”. Charlotte directs the Hope Village Human Rights & Conflict Resolution team at Yale University and oversees DHAF's Communications and Development. Charlotte graduated from Yale College in 2017, where she studied English literature and human rights and worked on immigrant and refugee rights at legal and community organizations in the U.S. and in South Africa during the summers. Contact her at dhafoundation@gmail.com. Dr. Amina Mohamed, Dr. Hawa’s second daughter, was born and raised in Somalia. Dr. Amina also studied medicine in Russia and graduated in 2004. Since returning to Somalia, she worked extensively with Dr. Hawa and led the surgical department in the Dr. Hawa Abid General Hospital. From 2007 to 2010, Dr. Amina worked with Doctors Without Borders, working in the hospital’s pediatric and outpatient clinic. She was the president of Dr. Hawa Abdi Foundation in Kenya from 2012 to 2014. She then founded and ran her own private clinic in Nairobi, Kenya. Along with her mother and sister, Dr. Amina received Glamour’s Women of the Year award in 2010. Currently, Dr. Amina oversees the security and border protection of Hope Village. She is very passionate about the safety and security of families in the village especially domestic violence cases. She also runs a private family clinic in Mogadishu and the family farm, and is an entrepreneur, with a focus on sustainability.